The Amazing Power of DOG. To say that Richard Gonzmart is a passionate human being is almost an understatement. As President of Columbia Restaurant Group and a 4th generation family member, he has helped the restaurants garner many prestigious awards. Richard Gonzmart with Rex and Rusty in front of the Columbia Restaurant, Ybor City. Photograph by Anna Cooke for The New Barker dog magazine. But Richard’s most notable accomplishments are rooted in giving back to the community. And despite whatever obstacle encountered – he continues to move forward, never looking back. Admittedly, this has been no easy task. Richard is motivated to find a cure for cancer as a result of having friends and family affected by the disease, who are surviving and even thriving after treatment. After experiencing their dedication and commitment firsthand, Richard continues to donate to and raise money and awareness for the University of Florida’s Veterinary School of Medicine, Oncology Department. 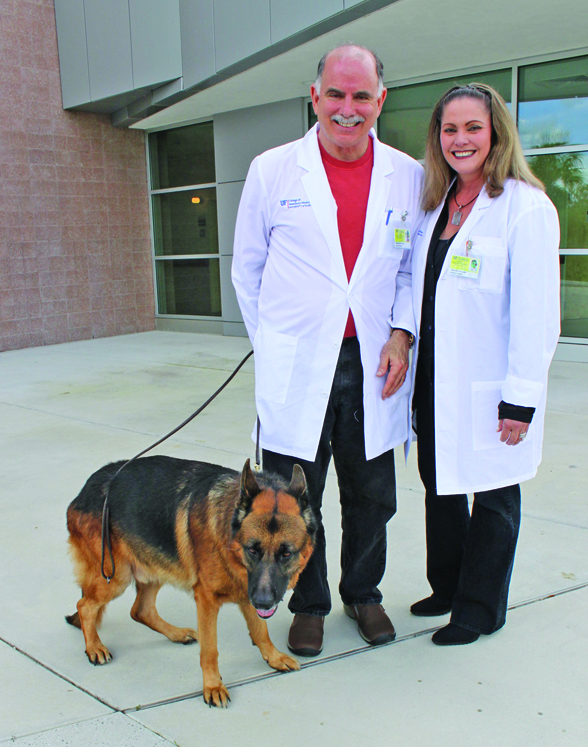 Richard Gonzmart with his wife Melanie and their German Shepherd Dog, Rusty in front of the University of Florida Veterinary School of Medicine in Gainesville, Florida. He hosts several events throughout the year to help raise funds for H. Lee Moffitt Cancer Center & Research Institute for Adolescent Young Adult Sarcoma research. One of those events, RICHARD’S RUN FOR LIFE, is coming up on November 1st in Ybor City. In 2011, eight-year-old Josalyn Kaldenberg was just a few days away from having her right arm amputated due to a malignant tumor inside the humerus. 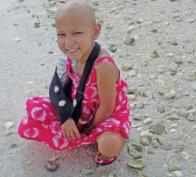 Shriners Hospital for Children and Moffitt Cancer Center teamed up to perform unprecedented surgery to save her arm. 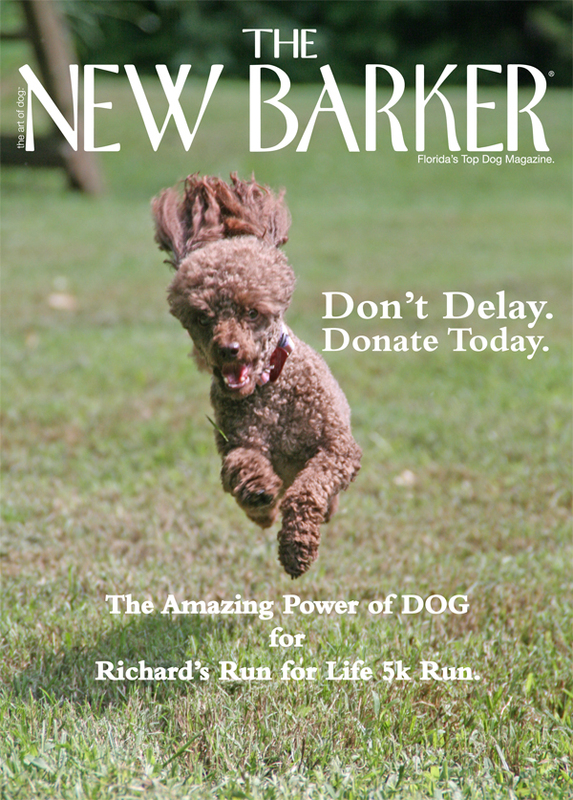 We are inviting you, fellow dog lovers, to join THE NEW BARKER in support of the 2013 RICHARD’S RUN FOR LIFE 5K Run. THE NEW BARKER has pledged to raise another $1,000, as we did in 2012, thanks to our fellow dog lovers, subscribers and supporters. The 2012 Richard’s Run for Life race honored Josalyn, who is once again playing the piano and playing with her four younger siblings and the family’s two dogs. We’re asking just 1,000 of our subscribers and supporters to each donate $1. In return, a photo of your dog will appear in the next issue of THE NEW BARKER. Then we will create a limited edition poster commemorating the run and the accomplishment of 1,000 dogs and their humans. THE AMAZING POWER OF DOG poster, featuring your participating dog, will go on sale in 2014 to help continue to raise money for Mr. Gonzmart’s cause. 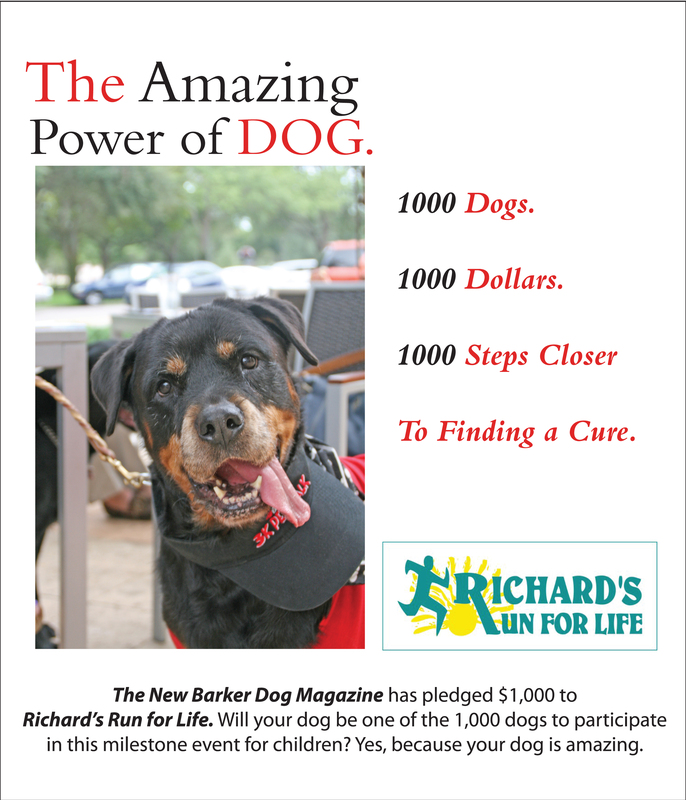 The New Barker Dog Magazine has pledged $1,000 to the 2013 Richard’s Run for Life 5k Run. Will your dog be one of the 1,000 to participate in this milestone event for children? Why, yes…because your dog is amazing. By the way, 100% of the money raised through RICHARD’S RUN FOR LIFE goes to H. Lee Moffitt Cancer Center & Research Institute for Adolescent Young Adult Sarcoma research. After the run, registered runners and walkers are treated to the Best Post Race Party Ever in Centennial Park featuring music, food and drink provided by Columbia Restaurant. 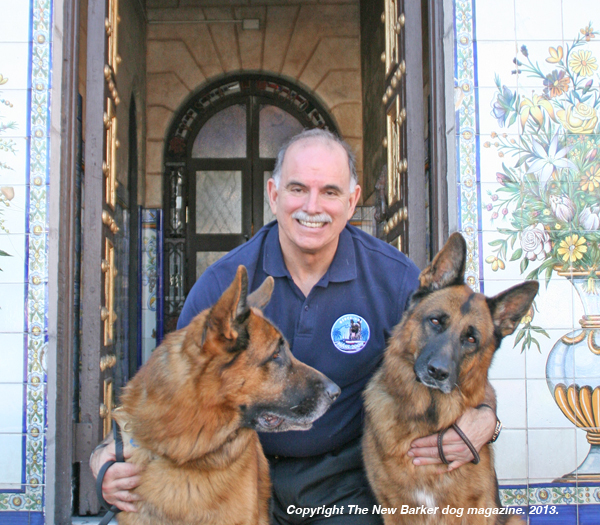 If you are inspired to give more, for a $5 donation, you will receive the next edition of The New Barker Dog Magazine, mailed to you, as our gift + a picture of your dog in the magazine and on THE AMAZING POWER OF DOG poster. Visit www.thenewbarker.com and click on the DONATE link. Your $1 pledge will get your dog’s photo in the next issue of The New Barker dog magazine. Your dog will also be honored on the commemorative poster, The Amazing Power of DOG. Hurry. We only have five days to go. Hello: I donated $50 as I just lost a beloved dog (see below) to aggressive cancer. I’d like his photo to be part of the collage of donors. Please tell me to whom I can send it. URO-2, UAGII Windswept-Live Oak Privateer, CD, RAE, NFP, NAP, OJP, “Rhett”, You will Always be The Big Dog. 2004-2013 R.I.P. We are very sorry to hear about the recent loss of your beloved dog. Thank you for your donation to Richard’s Run for Life, and your continued support. Please email your photos to info@thenewbarker.com and include Amazing Dog in the subject line. Gorgeous Dogs!!! Cancer took my grandfather, my hero, from me. My grandmother, 93 years old, survived breast cancer. Mr. Richard Gonzmart, THANK YOU!!! Previous Previous post: Every Home Should Have a Dog. And Every Dog Should Have a Home. Next Next post: Dunedin’s 50th Annual Art Harvest.